Hangover cures after a night down walking street! Unless you’re one of the rare breed that never seem suffer hangovers here are some top tips that may help you the following day after a ‘banging’ night out on Walking Street! Prevention is better than cure right? Here are some good preventative tips before a boozy all-nighter on Pattaya’s party street. First off it is best not to drink on an empty stomach, so make sure you eat a good meal before you start, otherwise come 2 am you will be the first to falter and you’ll be heading for the hangover from hell in the morning! Eating after getting slaughtered is not so effective in combating the pending morning hangover, however, eating before drinking slows down the alcohol absorption rate into your body! Another preventative tip is not to mix your drinks. It is best not to mix the grape and the grain, some say this is true for them. Maybe granny was right! Also if you want to party and remember what happened and still have fun, why not drink a bottle of water every second or third drink? It’s not a bad idea and you are in a tropical country after all. 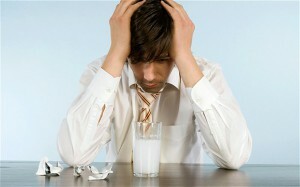 Much of a hangover is often attributed to dehydration as well as the chemical abuse! Choice of beer can really have a big effect on how bad your hangover is the following day. Some beers have more chemicals and additives than others, which tend to lead to a worse hangover. Check out San Miguel light if you want a clearer head and are watching the calories, light beers are often favoured in Pattaya. The Morning After….. Ok, so you disregarded all the sensible preventative advice and your head is banging, what is the best thing to do? Drink water, you are almost certainly dehydrated. Go back to bed and sleep it off, if you can! Eat something, if you don’t feel sick. You may only be able to cope with drinking a little water, in which case, go back to bed! Don’t ride your motorbike, you’re still drunk and incapable of quickly reacting to the dangers the roads have to offer. Rassol – This is a favourite for Russians, seeing as there are so many in Pattaya it’s worth a go! Rassol is made by boiling and seasoning cabbage then you drink the brine! Full of natural goodness. The salts help you to re-hydrate. Wheatgrass – In drink form wheatgrass doesn’t taste so great, but is now available in tablet form. The natural compounds help break down the toxins in the body. Oxygen – A good old diver’s trick! A couple of blasts of oxygen can certainly help clear your head! Milk Thistle – In tablet form around 350 mg is the desired amount to take. Milk Thistle helps eliminate toxins from the liver together with monosodium glutamate contained in the pills! Saline drip – This has to be the fastest and most effective hangover cure, but rather extreme and unethical. Rehydration Drinks – You can buy rehydration powders at 7/11 and all pharmacies in Pattaya. If you can’t be bothered or you are incapable, try gator aid or similar! Hair of the dog – This often helps with removing the moody blues, but may not help with your banging headache!